was no longer Princess Magnolia. She was the Princess in Black. Poor Princess Magnolia! Her birthday party is perfectly planned for an afternoon filled with good times with her princess friends. She is suitably attired, the guests are arriving ... her monster alarm rings loud and clear. She must leave, change into her Princess in Black costume, and be off to stop a monster from eating a goat. Her horse is at the ready - off they go! Both are disappointed to leave the much-anticipated party, but duty calls. That is only the first disturbance of the afternoon. 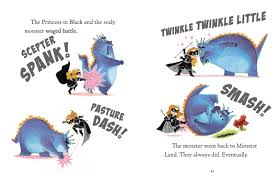 It seems that every time the party goers are ready for something fun to do, an alarm rings and Princess Magnolia must create a diversion so that she can attend to the important work of defeating monsters. The diversions work. However, every time she returns, changes back into her party paraphernalia, she looks a little worse for wear. Princess Sneezewort picks up on some clues to what is happening. She notices that Princess Magnolia is not always where she is thought to be. 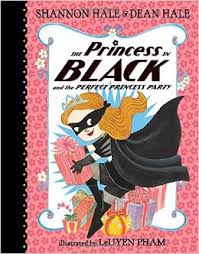 Identity in check, the Princess in Black remains a mystery to the end. There is much to ponder as early readers follow, chapter by chapter, the demands made of a superhero. It is not work to be taken lightly. It requires dedication, self-sacrifice and time. After a series of interruptions, she has every right to lose her cool when confronted with yet another monster threatening Duff the goat boy's charges. That monster is stunned by her reaction, and contrite. It provides a birthday gift that proves very useful when Princess Magnolia returns to her palace. A funny, welcome addition to the Princess in Black series, this book shows fans that, while she may appreciate the many benefits of being a beautiful princess, she has the moves needed to slay monsters in another action-filled adventure. February brings the third installment ... The Princess in Black and the Hungry Bunny Horde. Sure to be a winner, leaving happy readers begging for more.